A big miss of Germany’s emissions target is setting up accelerated coal closures. This will rebalance European power markets, pricing & flex requirements. European carbon emissions have declined 10% over the last decade, mainly driven by a reduction in power plant emissions. Renewables have led policy efforts to decarbonise the European power sector. But renewable deployment has not been the primary factor driving national emissions performance. Germany has led the renewables investment charge. The renewable share of German generation output has increased from 15% to 33% across the last decade, a huge rise given the scale of capacity roll out required. Yet Germany is one of Europe’s worst performing countries when it comes to emissions reductions, with only a 5% decline (2008-17). 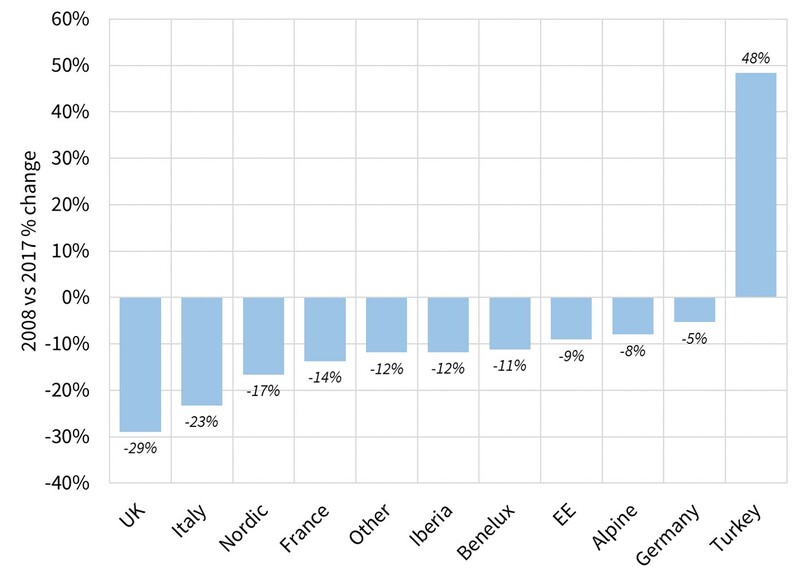 The best performing country from an emissions reduction perspective is the UK, with a 29% drop across the last decade. The UK has had steady (if somewhat wayward) policy support for renewables. But this has not been the primary driver of emissions reductions. The heavy lifting has been done by the UK carbon price floor, which has effectively driven coal out of the generation mix. Germany’s poor emissions performance is about to make its mark. Domestic and international pressure to address emissions is driving a shift in Germany policy focus. This will have important implications for the German power market and knock-on effects across neighbouring power markets. 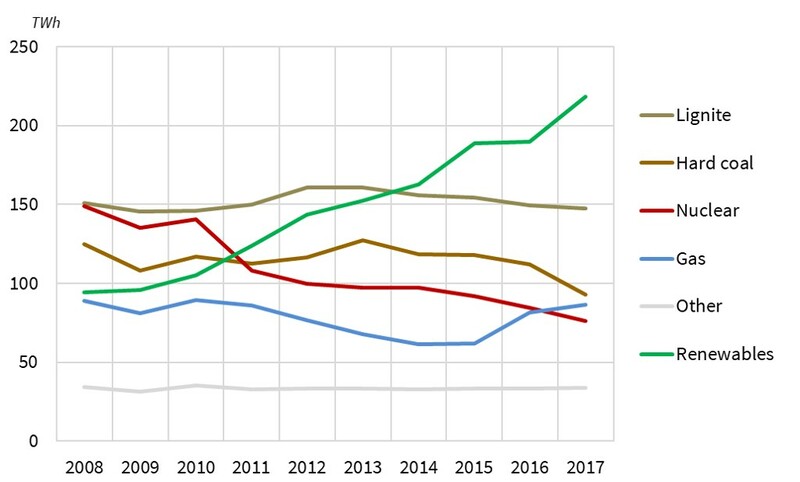 Chart 1 shows the emissions performance of a grouping of Europe’s major countries and regions over the last decade. Although Turkey sits within European borders, it has characteristics that are more consistent with emerging economies. Turkey’s increase in emissions has been driven by rapid economic growth, fuelled predominantly by coal. Turkey aside, it is Germany’s poor emissions performance that stands out. This has become the source of much public debate within German borders and abroad. Germany is heading towards a big miss of its 2020 emissions target. This is forcing the new German government to confront emissions policy. A recently published German Climate Projection Report estimates that Germany will only achieve a 32% reduction by 2020 (vs 1990 levels), compared to the 40% target. The Agora Energiewende think tank suggests the reduction could be as low as 30%. That would represent a humiliating 25% shortfall against Germany’s headline climate change target. Germany’s emissions problems do not just relate to the power sector. Increasing economic growth & immigration related population growth are causing higher emissions across all sectors. Emissions in the German transport sector have been particularly poor due to the slow roll out of lower emissions vehicles. However, as we pointed out in our previous article on global emissions performance, it is the power sector that will do the heavy lifting if Germany’s emissions performance is to improve. German power sector: what has gone wrong? Germany’s power sector challenge is illustrated in Chart 2. Almost 60% of emissions reductions from renewables deployment have been offset by the closure of nuclear power plants across the last decade. At the same time lignite output has increased as new plants have been built, despite lignite’s very high emissions intensity. Hard coal output was also relatively steady across the last decade, excluding the dip in 2017 which related to coal to gas switching given higher coal prices. In summary, Germany’s renewable efforts have been undermined by closing nuclear plants and doing nothing to reduce net coal emissions. It is likely that it is politically ‘too late’ to reverse Germany’s nuclear closure program. That is set to magnify the focus on coal plant closures into next decade. The resilience of coal to date, reflects the strength of local political support for coal in some parts of Germany. But the emissions target miss is setting up a showdown between Germany’s emissions agenda and its coal lobby. Germany does not face an easy challenge to get its emissions performance back on track. But the quickest solution (short of halting nuclear closures) is to close older hard coal & lignite power plants. The impact of closures is clearly quantifiable. Germany is also already in the process of defining an implementation plan for coal plant compliance with the Industrial Emissions Directive (IED) requirements. Although this is focused on NOx emissions, it provides a powerful policy lever via which to close coal & lignite. A new German coal commission was launched in June to develop a plan. The commission is anticipated to revert with a set of recommendations before the COP24 Poland climate summit in Dec 18. Whether it is via this process or subsequent ones, Germany’s coal & lignite plants risk facing accelerated closures. From an emissions perspective they are the low hanging fruit. But closing coal at the same time as nuclear will be challenging from a security of supply perspective. Capacity rebalancing: Closing coal and nuclear plants at the same time across the early 2020s will sharply tighten the German capacity balance. This will drive a rebalancing of NW European capacity, particularly given coal & nuclear closures in other markets. Energy squeeze: Dual coal & nuke closures creates the risk of a significant wholesale ‘energy’ squeeze in NW Europe in the mid to late 2020s. It will be very difficult for a combination of renewables & storage to keep pace. Price setting: Gas will quickly displace coal as the dominant source of marginal power price setting by the early 2020s. That will act to reduce power price differentials across Europe. Gas market impact: German thermal closures are supportive of European gas demand, given relatively high volumes of underutilised gas-fired capacity. This is set to have a knock-on impact on demand for gas supply flexibility e.g. from gas storage, pipeline & LNG regas infrastructure. When Germany sneezes, the European power market catches a cold.